People who read books on eReaders read more books in a year than people who don’t use eReaders, according to a new study. The study was done by the research firm Harris Interactive, as part of their well-known Harris Poll. The study found that nearly 30% of people using an eReader said they read more than an average of 20 books per year. Approximately 20% say they read between 11 to 20 books per year, and about a quarter say they read between 6 to 10 books per year. That averages out to about 75% of those using eReaders reading six or more books in a year. For those that don’t read with an eReader, about 20% said they read no books at all during an average year, another 20% typically read between 12 books per year, and another 20% read between three and five books per year. Averaged out, that means about 60% read five or fewer books per year. 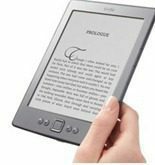 Of course, common sense dictates that avid readers are more likely to purchase and use an eReader that those than don’t read much. What would be interesting is if the study indicated whether there was an increase or decrease in the number of books read after someone purchases in eReader. We can speculate it would increase, but that’s only speculation. The study, or at least the parts they have released so far, didn’t cover that. The study also found that eReader ownership is increasing. During the summer of 2011, 15% of Americans said they used an eReader. Just seven months later, that number has doubled to nearly 30%. However, it was also interesting to note that the number of people who say they plan to purchase an eReader within the next six months has ticked down a few percentage points. In the summer 15% planned on purchasing an eReader, seven months later it was down to 13%. It could be that as tablet prices decline, shoppers may be more interested in more full-featured devices that include an eReader app, over getting a dedicated eReader only device.